The definition of bioluminescence "is easier than the pronunciation and spelling of the word: It is just visible light made by living animals," says Edith Widder, president of the Ocean Research and Conservation Association in Fort Pierce, Fla. The word may be easy to define, but the chemical process is still poorly understood. Bioluminescence has apparently evolved independently at least 40 times in species belonging to more than 700 genera, or classifications of organisms. Widder notes in the journal Science that about 80 percent of those genera are found in the open ocean. 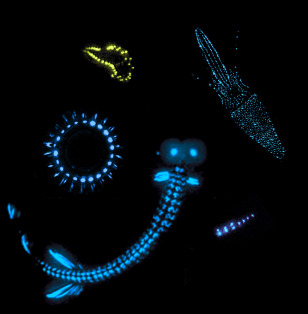 Examples of bioluminescent organisms include yellow-glowing Tompteris worms (upper left). Also pictured (clockwise) are the squid Abralia veranyi; northern krill, known by the scientific name Meganyctiphanes norvegica; the scaleless black dragon fish (Melanstomias bartonbeani); and deep-sea jellyfish (Atolla wyvillei). Click the "Next" label to learn more about bioluminescence. There are no trees or bushes to hide behind out in the middle of the open ocean, but animals still have to hide from their predators. "What an awful lot do is, they go down and hide in the dark depths in the day and only come up and eat in the food-rich surface waters ... under the cover of darkness," Widder says. 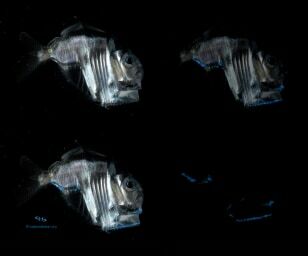 As a result of this lifestyle, most of these animals, including the deep-sea lanternfish shown here from the Bioluminescence Web Page, spend their lives living in near-darkness. "But they originally evolved in surface waters where they had eyes and visual signals, and as they evolved into the darker depths they evolved more and more sensitive eyes and enhanced visual signaling capabilities, which is what bioluminescence is often used for," Widder says. 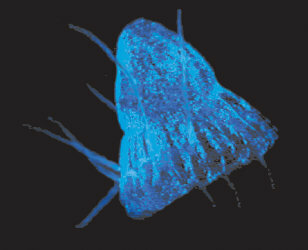 One of the most abundant deep-sea jellyfish, Periphylla periphylla, is shown here illuminated by its own blue bioluminescent light. "Because most bioluminescence has evolved in the open ocean, most emit blue light, which is the wavelength that travels farthest through the water," Widder says in her Science article. 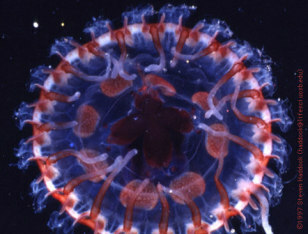 Many marine organisms — such as the deep-sea jellyfish Atolla vanhoeffeni, shown here - use bioluminescence for self-defense. When disturbed, it flashes a bright display that serves as a distraction. Other organisms actually release their bioluminescent chemicals into the water, akin to the way an octopus releases an ink cloud. The mechanisms work because many predators have "super-sensitive eyes for seeing in a very dim light environment and they don't have eyelids, so that is definitely going to be a blinding effect," Widder explains. Anglerfish, such as the Chaenophryne longiceps shown here, "have bioluminescent lures to attract food to them," Widder says. 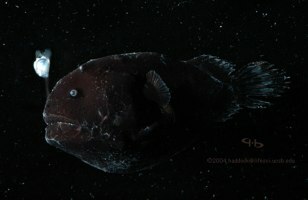 Unlike most organisms that synthesize their own bioluminescent chemicals, however, anglerfish have developed a symbiotic relationship with bioluminescent bacteria that grow inside its retractable lure, called an esca. Many species, including this hatchetfish, use bioluminescence as camouflage in a technique known as counterillumination that obliterates their silhouettes. "They have bioluminescent organs on their bellies that exactly match the color and intensity of the downwelling sunlight so that they just disappear," Widder says. "It is the ultimate cloaking device." In this series of images, the light-emitting organs known as photophores have been stimulated to fluoresce in ultraviolet light. The UV-fluorescing effect is not considered true bioluminescence. In the sea, however, the photophores do emit light, according to the Bioluminescence Web Page. "The ecological importance of bioluminescence in the ocean is manifest in the dominance of light emitters in the open water," Widder notes in Science. 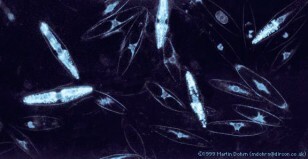 Bacteria and marine plankton such as the dinoflagellate Pyrocystis fusiformis, shown in this image made with a low-light camera attached to a microscope, are the most abundant light emitters in the ocean. Fish and crustaceans dominate the oceans in terms of light-emitting biomass. "Bioluminescence's import is also evident in the large number of organisms that retain functional eyes to detect bioluminescence at depths where sunlight never penetrates, and in the remarkable degree of diversity and evolutionary convergence among light-emitting organisms," Widder says.